Now is your chance to live in the tallest and most luxurious building in Fort Lauderdale. This iconic and recognizable 42-story glass building offers up the best in luxury living, both inside and out, in all of South Florida. The Las Olas RIver House is the Fort Lauderdale skyline, and will continue to be a beacon of luxury and prestige for decades to come. Units are now available in one, two, three, and five bedroom floor plans all with with finest features and fixtures. Lifestyle options are abundant at Las Olas River House, with one bedroom units starting at $475k and 855 square feet of living space all the way up to five bedroom units with a whopping 8,329 square feet of living space selling for $13.9M. No matter your budget or space needs, Las Olas River House has a model to fit your needs. Floor to ceiling glass windows give The Las Olas River House its iconic look, and provide you with plenty of natural light and heating/cooling efficiency. Double door entry is sure to impress your guests as well as the marble flooring throughout and spacious epicurean kitchens. Outfitted with top-of-the-line appliances and fixtures, the kitchens at Las Olas River House are enough to meet the needs of a professional chef or novice alike. Granite countertops and lacquered wood cabinets provide a designer finish and seamless design scheme throughout your home. Bathrooms come standard with marble floors, glass enclosed rainwater shower heads, and full-sized soaking tubs. Perhaps even better than the luxurious lifestyle inside of your home are the amenities offered at Las Olas River House. Feel safe and secure with 24-hour security and concierge service. Valet parking is available on demand to all residents and their guests. Speaking of your guests, they will be impressed by the expansive lobby complete with waterfalls and a fish pond. The rooftop pool deck at Las Olas River House is the place to be in Fort Lauderdale. This 60,000 square foot space is home to a heated pool with expansive views of downtown, the river, and the Atlantic Ocean. Practice your short game on the rooftop putting green, or relax in the piano lounge, library, spa, or salon. Everything you need to live a high-end lifestyle of luxury is all right at your fingertips at Las Olas River House. If you feel the need to leave the premises, you’ll be right in the heart of Fort Lauderdale’s bustling Las Olas district, complete with hundreds of dining, shopping, nightlife, and entertainment options. If it is the arts you crave, the NSU Art Museum is right around the corner, and the Museum of Discovery and Science and the Broward County Center for Performing Arts are just a few short blocks away. 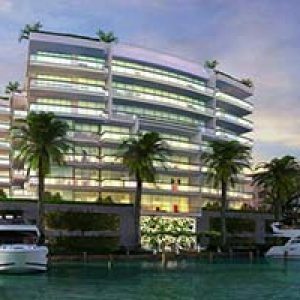 The Las Olas River House is the most recognizable building in the Fort Lauderdale skyline, and for good reason. Don’t miss out on your opportunity to own the biggest and the best in South Florida!